Yes all payments are taken online allowing you to see your session calendar, your payment and sessions attended. Do you have junior programs? Yes. We have summer camps for juniors age 6-14. They run M-F, 9:00-12:00. ACADEMY: we also have a year-round Junior Academy designed to develop great junior golfers. Click the Junior link to read more. Do you have programs for new golfers? Yes, absolutely! Get Golf Ready is the PGA's flagship program designed to introduce new golfers to the game. It's 5 sessions over several weeks for just $99.00. It is a gentle, low-stress way to learn how to hold the club, hit the ball, and navigate your way around the golf course. Individual lessons. Thursday Socials. Daily Supervised Training Sessions. Adult Sunday School. On-course Playing Lessons. Join us each weekday evening for supervised training on specific parts of the game. Designed to help you become more consistent so you can play better golf. For new golfers. Each Saturday we have a putting clinic at 10:00, followed by a chipping/pitching clinic at 11:00. Limit 6 golfers. Learn a little golf, socialize, have fun! Each month we focus on one part of the game, hit a few balls, and invite a local business to sponsor beer or wine tasting and food.. I shot my lifetime best! How well does Coaching work? After straightening my swing on radar and learning my yardages plus your strategy advice I shot my lifetime best: 73!! I (was) a 14 index! I've dropped 10 strokes in 6 months, learned to plan my shots better on the course, and gained confidence around the greens. I love your coaching program! At Eric Jones Golf, you get a golf coach. The definition of a coach is simple. A coach gives you what you need, to achieve your goal. 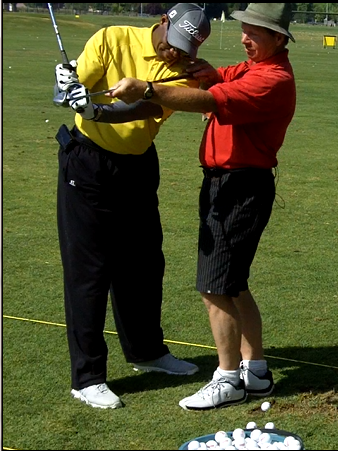 At Eric Jones Golf, we go far beyond the call of standard golf instruction. We’re here to get to know your game, to understand your goals, and help to bring those results out of you. Golf instruction is often complicated, overloading, overwhelming, and leads to poor results. In our coaching programs, we look to simplify what you learn, get rid of excessive thinking and excessive changes so that you can gain the consistency in low scores that you know that you’re capable of. Golf is a game of misses, it’s never been a game that can be perfected. And at Eric Jones Golf, we’ll show you how to understand how professional golfers think so that they avoid the mental overload that often comes with the game of golf, and in turn free up your mind and free up your swing so that you can play the golf that you know you’re capable of. We’ve all heard the saying “Paralysis by analysis.” That’s something we avoid through helping you to find the right way to find your identity when you play the game of golf. The game of golf is a game of scoring. It’s not about perfect shots. It’s not about long drives. It’s about getting the ball in the hole. At Eric Jones Golf, we show you the key elements to scoring and how to manage your game on the golf course by avoiding trouble, strengthening your weaknesses, and identifying your strengths and playing to them. All of these help eliminate blow-up holes and bring consistently lower scores to your game. Purposeful Practice In all of our coaching programs, we work with you to teach you how to practice with a purpose and how to gain consistent results. The question we ask is “Practice makes what?” If you answered ‘perfect’, I have news for you. That’s a lie. Practice only makes permanent. So if you don’t practice like you intend to play, you’re ingraining inconsistency in your game. We’re going to show you how to put simple practice routines together that bring lasting change and make practice fun. At Eric Jones Golf, we guarantee our results. We believe if you’re willing to commit through your time, through your effort, and through money, we’ve got to commit to what we believe in. If you’re interested in getting your game on the accelerated path to golfing excellence, it’s time to take action. Contact us now and let’s get you signed up for a program that fits your schedule, your goals, and your budget.